Thanksgiving pie line up: Let’s Make ALL the pies! Caroline 2.0 here with this years pie guide just in time to give you a few practice pies and some fodder for family survey’s before the ultimate pie day comes! Your friends named Caroline are bad at all sorts of things, 1.0 has a terrible sense of direction, 2.0 freaks out in an emergency and always makes it worse, but we are dang good at pie. If you won’t be the one baking pies, go ahead and send this to the person who will, we personally guarantee a better thanksgiving if you do. A great place to start is with our pie crust recipe and FB live tutorial video that’s on our Facebook page, You’re going to want to offer guests a nice variety of pies. I’m going to break it down for you in a few categories and give you some of our favorites to choose from to make it easier for you to figure out a show stopping pie offering this week. In the King household we like to have about a half pie per person, if that seems like too much for you, I recommend no less than 3 pies for a proper Thanksgiving meal, many you can make all, or partly in advance, and the key is to offer a nice variety. Here are a few categories to help guide you. CHOCOLATE PIES: Duh – this is obviously the category I start with and you need a pie with chocolate or you’re table is sad 😦 There are LOADS more than what is listed below, but I’m going for favorites here and trying not to loose you with too much info so search chocolate pie for a more complete list. Chocolate Cinnamon Mousse – This is one of the pies we are best known for because it is truly both Caroline’s favorite pie and one of the best tasting desserts on the planet. It’s a little more involved than some pies because there is a meringue layer etc. so it will take a little time, but it’s not very difficult and So worth the effort. Every time I make a selection of pies it’s the first gone without fail. Chocolate Granola Pie – This is another pie we are well known for. I make it frequently because our family can’t get enough of it and it’s a frequent request of friends. I also make it often because it’s SOOOO EASY! It’s almost like a candy bar that was made in heaven, you really need to try it. Double Chocolate Pecan – This pie checks two boxes which is why I keep hearing more and more people tell me that they made it and are not absolutely crazy for it. It pops off amazing chocolate flavor and then you get that magical nuttyness you want from your pecan pie, but delivered on a chocolate train. It’s also a cinch and great if you’re serving a smaller table and want something that satisfies the pecan pie and chocolate pie needs all in one. Chocolate Cream Pie – This is the quintessential cream pie of your dreams. It always turns out fantastic, even when I don’t have enough bittersweet chocolate so I need to use chocolate chips, or a sub half with unsweetened, or I don’t have whole milk so I use whatever’s in the fridge. It’s just always delicious. It’s not the very easiest pie, so if you’re new to pie making choose one of our crazy easy chocolate pies like chocolate chess or chocolate brownie pie, but you can’t find a cream pie this creamy dreamy delicious anywhere else. I need to add this year my new(ish) Black Bottom Vanilla Cream Pie with Salted Caramel sauce. I made these for Father’s Day this year and people went absolutely crazy town over them. It’s a great option because there’s really nothing not to like whereas with nuts, or coconut, or berries you might get a few picky pants people, it’s nice to have one pie everyone is eager to devour. FRUIT PIES: This time of year, there isn’t loads of fruit to be found, but you can use frozen and come out with amazing results if you do it right. Also, lemon is a fruit and you could even check this box with pumpkin or sweet potato if you wanted to. Salted Caramel Apple – This is one of the pies people ask me to make the most because when people think of pie they often think of apple pie and salted caramel is such a brilliant choice to compliment apples it’s a slam dunk every time. I love to use granny smith apples and get a nice sour thing happening, but any apples will do. It’s a bit of a time vacuum but so fun to make, and a crowd pleaser for sure. Blueberry Crumble Pie – I’m obsessed with this pie, and there are a lot of blueberry pie kids out there just like me. The crumble was my idea and it totally makes the pie in my opinion. The last time I made this it was with almost entirely frozen berries. I did thaw them first, but they came from the freezer section at Trader Joes and the pie set up firm and perfect and tasted absolutely incredible. This pie with good vanilla ice cream is just insanity. You could also do our strawberry streusel pie with frozen berries too as long as you defrost them first and discard all extra juices every change you get – that plus a long bake ensures a pie that sets up with no soupy factor. Remember a crust guard if you do a long bake so you don’t burn that beauty on the edges. Lemon Cream Pie – This is a year round pie for sure – and at Thanksgiving I would say pile it high with meringue for a delicious and dramatic effect, but it’s divine and easy with whipped cream. It’s got such mouth melting sourness and the crust is a crumb crust so there’s zero intimidation factor. It’s a total cinch and will fulfill all your lemon needs. But if you want a more traditional, Lemon Meringue Pie we posted one a few weeks ago that is just like your grandma’s, it’s a bit more difficult than the Lemon Cream, but worth the effort for nostalgia’s sake. TRADITIONAL PIES: This time of year people tend to want the flavors of home, so I’m not even mad if you prefer to offer a very traditional selection. I would put Caramel Apple Pie in this selection, but it’s sitting up there in fruit pies so click that link for sure. My husband feels very strongly that Thanksgiving is a total fail without his Mom’s Pecan pie…..speaking of which..
Caramel Pecan Pie – This is such an amazing and consistently delicious pecan pie. I have been commissioned to make it on multiple occasions and every time someone I know makes it they rave and rave. It’s a King family classic. Pumpkin Dulce De Leche– I’m making this in the morning and Caroline 1.0 made it yesterday. It’s like traditional pumpkin pie, turned up to 11. If you’re scared of the caramel on bottom, just make the pie filling recipe – you will never buy a Costco pumpkin pie again. Toasted Coconut Cream Pie – I include this because it’s the cream pie base for all my favorite and most famous cream pies. I use it frequently to make banana cream pie which is just bonkers delicious and the recipe is the same as this, just add about 5-6 sliced bananas alternating with the filling as you fill your baked crust. A solid cream pie is kind of a must and you can choose from many on twocarolines but this one is such a blue ribbon winner and who doesn’t love coconut!? NON-TRADITIONAL PIES: I have to give a nod to some of my very favorite pies of all time that your grandma never made for you. Having a unique pie at your table is a way to show your guests that you know how to have fun in the kitchen and then you will blow doors with flavors they might have never expected to win them over. Trust us. Double Chocolate Peanut Butter Pie – Oh man do I love this pie, like, I love it SO MUCH you guys, and it’s so easy and the ultimate crowd pleaser. It has amazing chocolate peanut butter flavor plus a nice layer of chocolate ganache and just enough salt in the oreo crumb crust to make your mouth flood with satisfaction. Maple Lime Custard Pie – This pie came about after a neighbor brought us a bag of limes from her tree and it was such a triumph! It has that magical citrus sourness perfectly balanced by the maple and creams. I thought it would taste to sweet but it’s not at all, this pie sends you off the rails on a flavor train and it’s an easy crumb crust you can do with graham crackers, animal crackers, speculoo’s or whatever is in your pantry. It’s really easy and will surprise and delight your guests. Chocolate Nutella Pie – I recently posted this as a guest post on the Elevate-Everyday blog. It kind of blew my mind – I just never knew a big cup of Nutella could add so much rich and complex nutty chocolate flavor to a pie. I went all out and added toasted hazelnuts which took some time but was such a special treat and I have to say this pie ended up on the shortlist of favorites right away. S’mores Pie – Who is the person that doesn’t like s’mores and why did you invite them to your holiday feast?! This pie that CK 2.0 posted a few months ago has had such a following because it’s everything that’s right about the perfect s’more wrapped up into a beautiful pie shell and presented as an elegant dessert instead of a campfire sticky finger concoction. Don’t wait until summer to enjoy the made for each other combo of chocolate graham crackers and marshmallows. 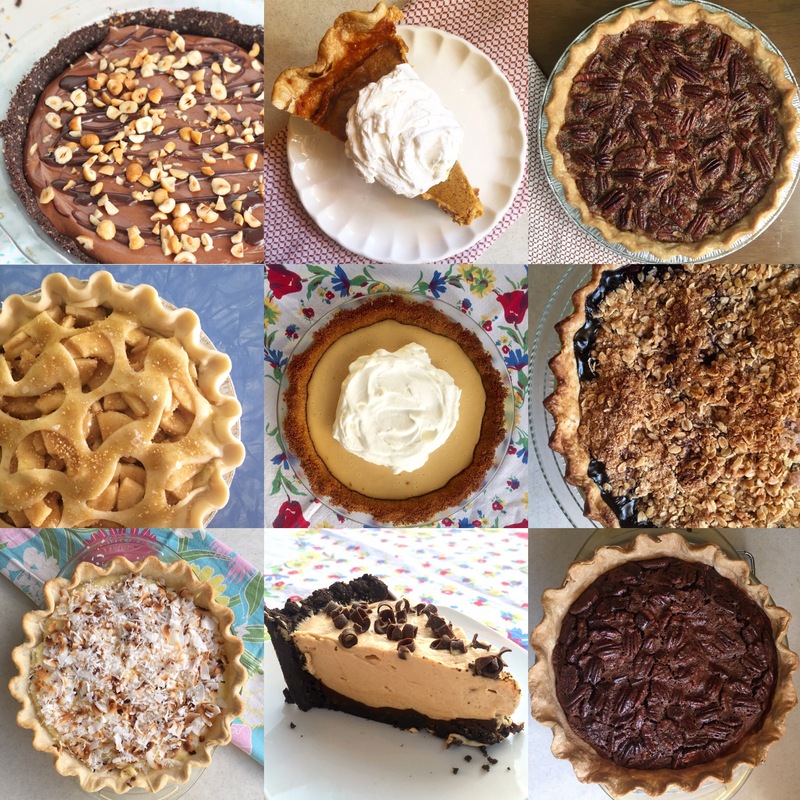 This entry was posted in Holiday Bakes, Pie, Uncategorized and tagged pie guide, pie selection guide, thanksgiving pies. Bookmark the permalink. Fantastic , so much efforts you are taking.